California’s wine country has been making a splash in the wine world since the 1970s and attracts thousands of visitors every year. Napa, Sonoma, Calistoga, and the Russian River valley lure people from all over the world. Activities like whitewater trips can add adventure to wine country itineraries—some of California’s best rafting is a 2-3 hour drive away. 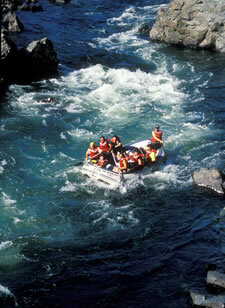 An American River rafting gives travelers a taste of Class III-IV whitewater and beautiful canyon scenery just 2.5 hours away from the wine country. The Wild and Scenic Status of the Tuolumne River canyon guarantees a private wilderness experience for rafters looking for peace and quiet after the busy crowds of the wine country. After touring the California wine country, head south and see another side of the Yosemite Valley by rafting the intermediate Class IV rapids of the Merced River.